The decisive actions taken by community people are a clear demonstration of the resistance against the advance of transnationals in regional towns. 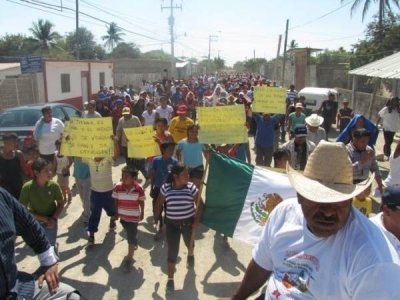 The Community Assembly of Álvaro Obregón states: “In the full exercise of our right to self-determination and autonomy as Binnizá indigenous people of the Isthmus of Tehuantepec, and in view of the violations of our territorial rights by the state government and corporations, we have resolved that as of tomorrow we will begin to organize the first detachment of our Binni Guia’pa’ Guidxi’ (community police) in defense of the land and territory; it will be made up of people from our communities.” During the march, this decision was underscored with signs, banners and chants demanding the exit of all repressive forces, making it clear that no kind of state or federal police is welcome and that access to the Mexican Army and Navy will be blocked. Upcoming resistance actions are proposed for February 13 in San Dionisio del Mar, and a call is being sent out for national and international solidarity and for the participation of indigenous peoples of the region and the country to cover the Humanitarian Caravan and Solidarity Cavalcade with Guidxi’ro Resistance that will be held on Sunday February 17, setting out from different points to then converge in Álvaro Obregón. Plans also call for shoring up the collection of provisions and supplies at Radio Totopo in Juchitán, and the Universidad de la Tierra in Colonia Reforma, City of Oaxaca. So this is the way resistance is being strengthened from within. Now it’s time for the peoples of Oaxaca, the country and the world to show their heartfelt support for the righteous people of the Isthmus of Tehuantepec.